The specter of We Need to Talk about Kevin by Lionel Shriver hangs over Defending Jacob. In both books, a teenage boy seems troubled and potentially dangerous but the parents do not want to face up to it. Kevin seemed like a bad seed, an alien landed in an unsuspecting family. Jacob however is a single child and his father knows very well that there is a risk that he might be violent, because there is a family history of criminal aggression in his line. Andy is a DA married to Laurie, but he has never told her that his father is in jail for the rest of his life, for murder. His grandfather and his great-grandfather were also violent. Andy has broken this threat of genetic destiny by leading a good and honorable life, being a valued member of the community. 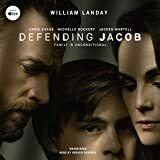 But when one of Jacob's classmates is murdered, and Jacob is accused of the crime, Andy worries that their family history will be used against Jacob in the trial. We Need to Talk about Kevin was not psychologically convincing, in that Kevin's alienation and cruelty was never really explained, although the family's reaction to him was plausible. In Landay's book, Jacob's potential violence does have an explanation, but it is not so clear that it is realistic. Could a boy from a loving middle class family really be a murderer? That's part of the mystery of the story. It is a riveting tale, mostly a combination of family and court room dramas. It is told mostly with Andy narrating, with occasional inclusion of a transcript of a Grand Jury questioning of Andy. So it is all from his point of view. He is a charismatic man, full of insightful opinions (albeit from a jaundiced point of view), which combine with a father's sincere love for his family. The plot unfolds piece by piece with a flurry of revelations at the end. The exploration of small town America, family life, law and menace is memorable. The unabridged audio book is performed with energy and good characterization. Andy comes across as both smart and self-deceived, which is a difficult combination to achieve.